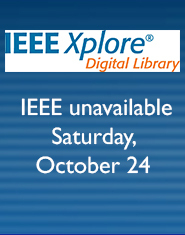 Due to scheduled maintenance, IEEE Xplore will be unavailable from 9:00 AM – 12:00 noon ET (13:00 – 16:00 UTC) on Saturday, October 24. In addition, certain web services such as single article purchase and personalization may be unavailable for a period of time on October 24. We apologize for any inconvenience and thank you for your patience as we work to continually improve the IEEE Xplore experience for all of our subscribers. If you have any questions, please contact Online Support (onlinesupport@ieee.org).